RDM630 125KHz card scaled down module is intended for perusing code from 125KHz/134.2KHz card good read-just labels and read/compose card. It very well may be connected in office/home security, individual recognizable proof, get to control, hostile to imitation, intuitive toy, and creative control frameworks and so on. DM630 125KHz card smaller than expected module is intended for perusing code from 125KHz/134.2KHz card good read-just labels and read/compose card. It tends to be connected in office/home security, individual recognizable proof, get to control, against imitation, intelligent toy and creation control frameworks and so forth. RDM630 Series non-contact RFID module, utilize the propelled RF getting circuit and installed MCU configuration, brushing with high productive translating calculation, to complete the information get of EM4100 and all the perfect cards. 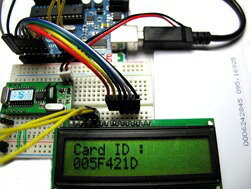 You can additionally associate hand-off arduino shield to your arduino with the end goal to empower the basic entryway guardian controlling framework.